Send joyful Christmas greetings to family, friends, or business associates. This pack consists of 5 blank greeting cards for you to write your best wishes and love. Each card measures at 6 x 4.5 inches and comes with envelopes. Ensure you have plenty of greeting cards for this holiday season! These beautiful and unique Christmas cards are professionally printed with a scene from my original wool paintings: “Snowman with bullfinches”, “Christmas tree”, “Snowman looking in window”, “Snowman with a broom” and “Snowman”. 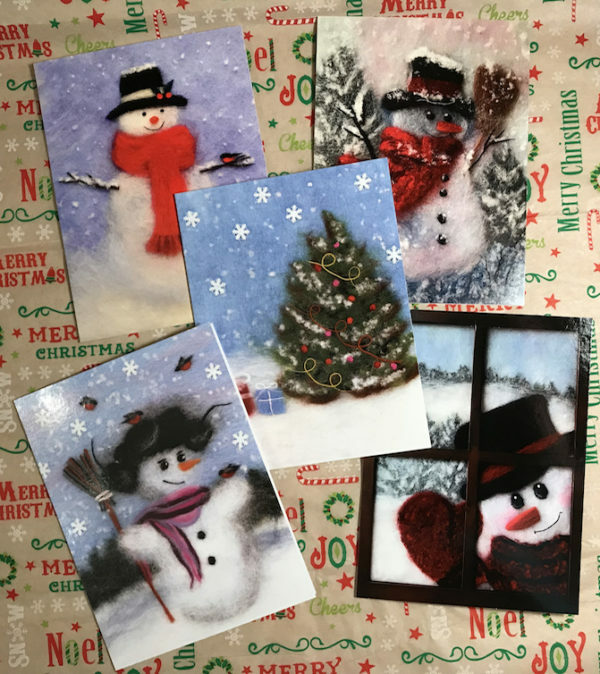 Christmas cards set: 5 pack of Christmas greeting cards featuring 5 attractive designs to wish your friends, acquaintances, and loved ones a happy holiday. Dimensions: each folded card measures 6 x 4.5 inches.